-SG- We touched on this subject before, when the 1926 Model 18 flat-tank bitza fitted with 1925 TT crankcases came up for sale at Bonhams. I have just come across this rather indistinct snap of it taken in probably the late forties, when it was owned by the Bovingden Brothers - that's them in the back-ground. Times were very different then and many a Vintage bike appeared with such niceties as aluminium mudguards and even dual seats. The object of the exercise was to get a bike up and running and if it meant fitting a few non-original parts, so be it. The Bovingden stable also included a CS1 fitted with thirties forks and doubtless other bikes I don't know about. 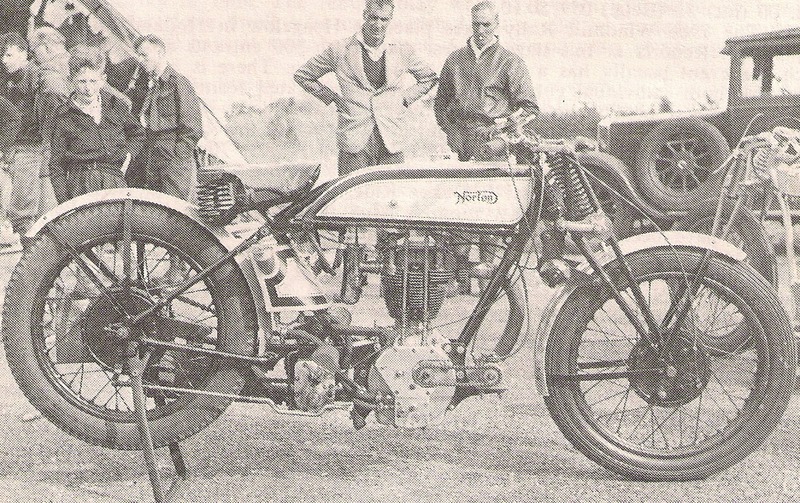 By the time I joined the VMCC in 1958, the brothers seem to have discontinued their membership but I understand they were very active in the fledgling speed events organised in the Club's early days.